Welcome to the newly redesigned Seattle Hockey Homepage. After more than ten years on the web, it was time for what will hopefully be an upgrade - a redesigned site with more content devoted to the history of hockey in Seattle. You’ll find season recaps, player and team photos, statistics, memorabilia and more related to hockey in the Emerald city from 1915 to today. Over 1,000 men suited up for Seattle’s teams over the years, from the Stanley Cup winning Metropolitans early 20th century to the Western Hockey League Thunderbirds of today. More than 250 of them played one or more games in the National Hockey League, and eight made such an impact that they were inducted into the Hockey Hall of Fame. Interested in learning more about the history of Seattle hockey? Check out these books! 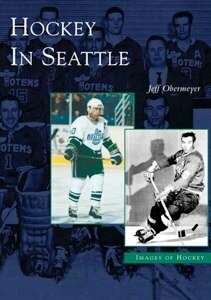 Hockey in Seattle (128 pages), published in 2004, is the history of Seattle hockey in photographs, from 1915 to 2004. Each major team is profiled, along with a chapter devoted exclusively the Seattle’s all-time greatest player, Guyle Fielder. Available in Seattle area bookstores and Amazon.com. 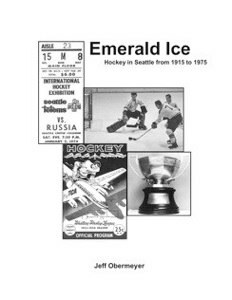 Emerald Ice (280 pages) was self-published in 2007 and provides a detailed season-by-season history of Seattle hockey. It also includes 90 pages of league standings, individual player statistics (updated using league and media sources), and lists of single season and career record holders. Available directly from the author for $28 (includes shipping). Questions? Comments? Stories to share? Memorabilia to sell? Send me an email! USAGE: If material from this website is quoted or otherwise used as a reference source in a published work in any format, please provide the proper citations/credit. Thanks! • Seattle and the NHL? 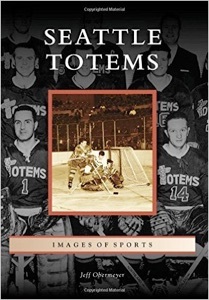 My newest book, Seattle Totems (128 pages), was released on August 24, 2015. It features over 200 photos, none of which appeared in my previous book Hockey in Seattle - all new images! Follow the history of the Seattle Totems as they battle their opponents on the ice in pursuit of frozen glory! Available online at Amazon.com.